We walked out of the airport in Edinburgh and were greeted by a gap in the clouds and a glimpse of blue skies. Things were looking up! We took a few more steps and realised it was also lightly raining. Little did we know, this was the best patch of weather we were to see during our whole visit to our first Scottish city. Edinburgh has a tram that goes from the airport straight into the city centre, just perfect for transfers. We had heard so many jokes over the years about how strong the Scottish accent could be, but everyone we had met had always been quite understandable. The elderly couple sitting behind us on the tram made me realised where those jokes had come from. I think I understood maybe one word in ten they were saying. No wonder people who don’t speak English as a first language struggle sometimes, if even native English speakers can’t understand the other accents. We were staying at the Ritz Hotel in Edinburgh. Okay, so not THE Ritz, but another place that had borrowed the name. I think that was all that they borrowed though. Oh, the place was a perfectly okay budget option, but luxury definitely wasn’t part of the business plan. It was still raining when we went out to get dinner that night, but the blue skies had gone and the rain could no longer be considered light. We ended up going straight back to our room afterwards rather than explore. The next morning the rain had stopped but it was bitterly cold with a wind that felt like it was straight from the arctic circle. We layered up and headed out, keen to explore. That lasted about ten minutes before I was so cold I was ready to go back inside. That wasn’t an option as we were rushing to join a Sandemans free walking tour. Unfortunately we were a few minutes late and missed the tour, but Edinburgh is so popular that even in the shoulder season these tours are run almost every hour. Even better, the meeting point is right near a Starbucks, which has really good heating. Oh, and coffee too! 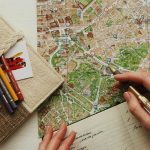 This free walking tour was possibly the most memorable one we did throughout our whole gap year, and that was mostly down to our fantastic guide, Adam. I’m fairly sure he thought he was doing a stage show, but in a good way. He didn’t just guide us, he performed. Edinburgh has so much interesting history. The Scots are a race known for their humour, and Adam weaved all this together beautifully. I have said before (see my posts on Vilnius and Warsaw for just two instances) how much I prefer free walking tours over paid ones and this tour was another perfect example. We had to laugh as Adam told us about Edinburgh’s animal emblem. The authorities looked at other countries with their symbols of power, lions or bears or dragons, and somehow managed to choose – a unicorn! These imaginary animals strike fear into, well, precisely no-one! Unicorns can be seen throughout the city, and one has a prominent place on top of the Mercat Cross, right in the centre of the Old Town. 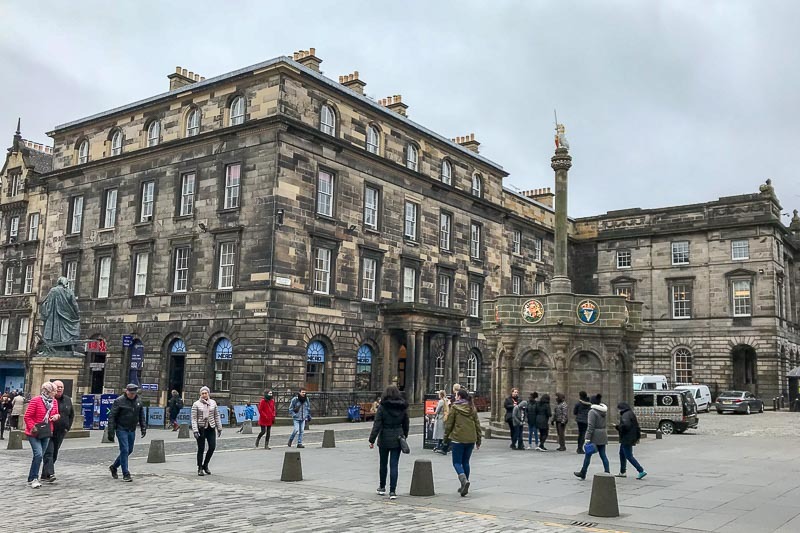 The Mercat Cross, or, Market Cross, historically marks the place where merchants are granted permission to sell their goods by the monarch. 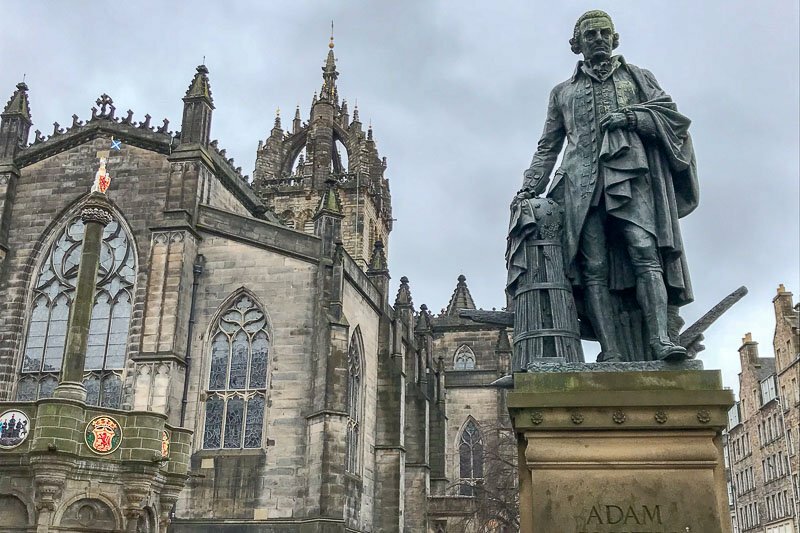 The Edinburgh one has moved slightly over the years, but can be found behind St Giles’ Cathedral. The Mercat Cross with Scotland’s animal emblem, the unicorn. As we walked, an intriguing heart mosaic in the pavement caught our attention. 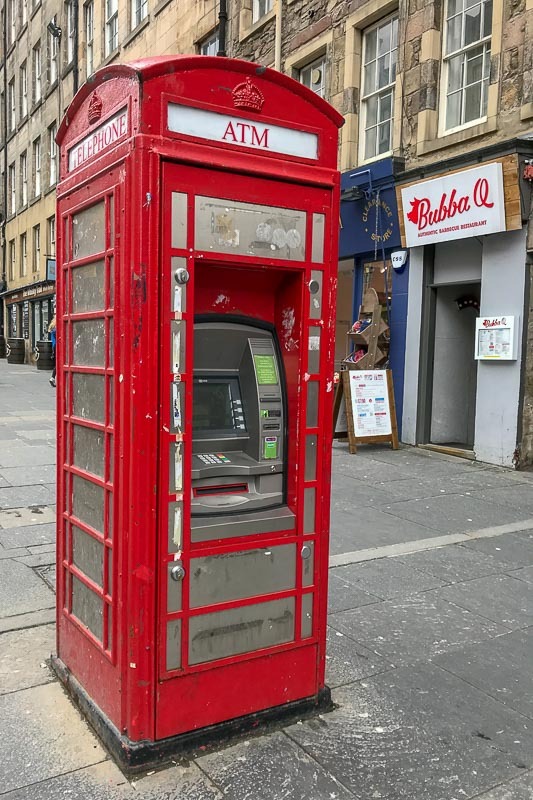 This is found on the Royal Mile and is the location of the Old Tolbooth, the place where taxes were paid, people were thrown in debtors gaol and public executions took place. So all in all, not a very popular or fun place. 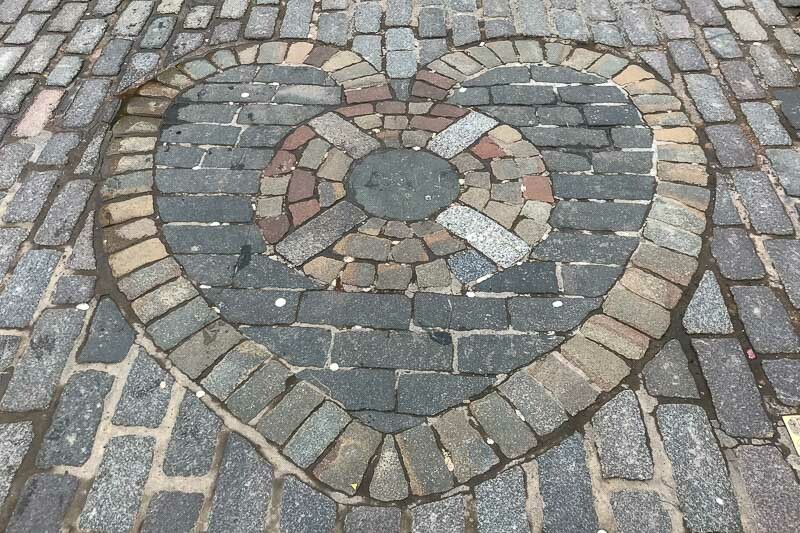 When the building was demolished in 1817, this heart mosaic was built into the paving using materials from the building, right where the door to the prison was. At some point it has become custom to spit on the Heart of Midlothian as it’s now called. 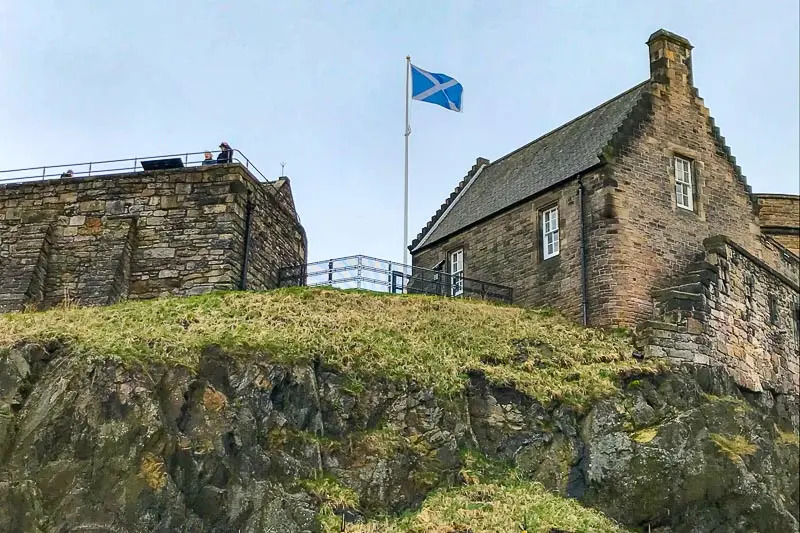 It is believed this started as a sign of hatred for the Old Tolbooth, and now continues on as an act to ensure good luck. 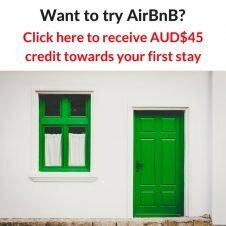 My suggestion – walk around it rather than over it! If you are walking down the Royal Mile in Edinburgh, walk around the heart! There were so many stories told that I hadn’t heard before. One of my favourites was about Maggie Dickson, or Half Hangit Maggie as she became known. She lived in the early eighteenth century and had the misfortune of being abandoned by her husband. 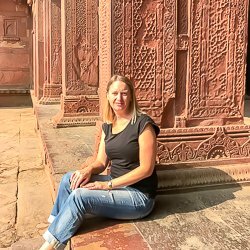 She needed to work, so worked for an innkeeper in exchange for lodgings. She soon had an affair, falling pregnant, but knew she would be dismissed from her job if her pregnancy was discovered. Unluckily (or luckily, depending on how you look at it) the baby was born prematurely and died, but Maggie didn’t know what to do with the body. She left it by a river, where it was soon found and linked back to her. She was charged for concealing her pregnancy (yes, that was a crime!) and sentenced to hang. As her body was being transported to the cemetery after the hanging, the driver heard knocking from the coffin and realised she was still alive. The powers that be saw this as God’s will, so Maggie went on to live for another forty years. Her pub can be found today very close to where she was hanged back in 1724. Maggie Dickson’s Pub still operates today. 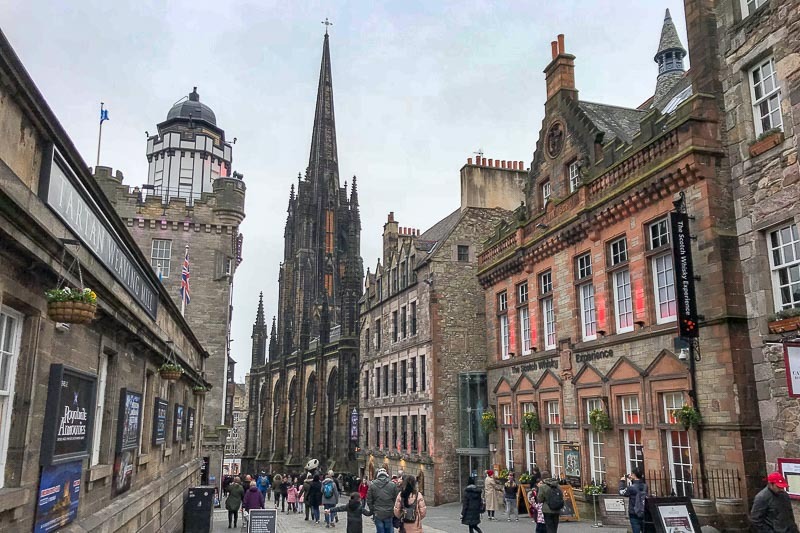 As we moved on through the streets of Edinburgh’s old town we learned about the architecture and some of the colourful characters that lived here. It started off nice enough, but as people continued to move into the city it became so crowded that the rich people started to abandon the old town in favour of cleaner air on the other side of the polluted lakes at the foot of the hill. The old town turned into slums, with filth, poverty and criminals being the order of the day. 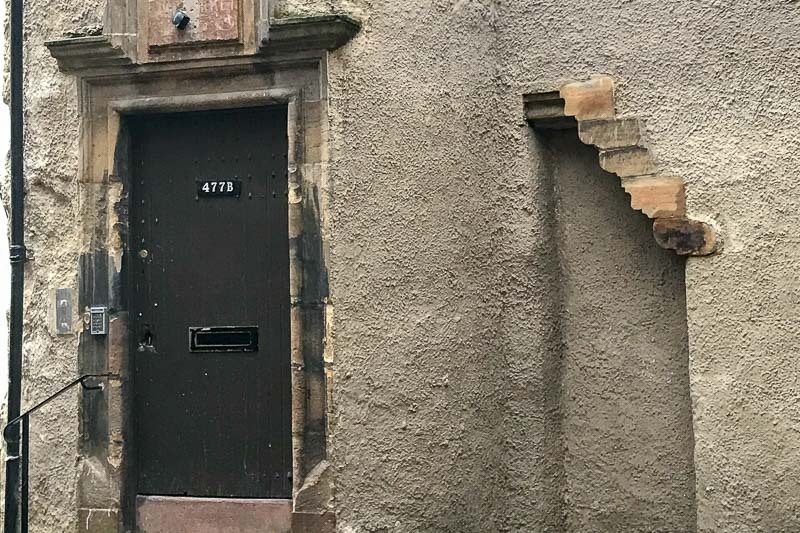 One of the inventions made to guard against the intruders that were becoming common in any house that had anything worth stealing, was the Edinburgh trip step. Staircases would be built with one step of an irregular height. This would cause intruders to stumble in the dark, alerting the occupants within. The uneven tread can be seen on the stairs now built into the wall on the right below. The Edinburgh trip steps, with different tread heights to confuse intruders. All these criminals meant Edinburgh had a large police force. One of the most well known is a night watchman by the name of John Gray. He’s not well known for his own story though, but for that of his dog. John Gray owned a little sky terrier called Bobby. Unfortunately John Gray died, and loyal little Bobby was so distraught over his master’s death he spent the next fourteen years sitting on his grave in the Greyfriars cemetery. Locals admired his loyalty, and brought him morsels of food. When registration laws came in, Bobby’s future looked bleak, but the Lord Provost of Edinburgh took up his cause and paid his registration. 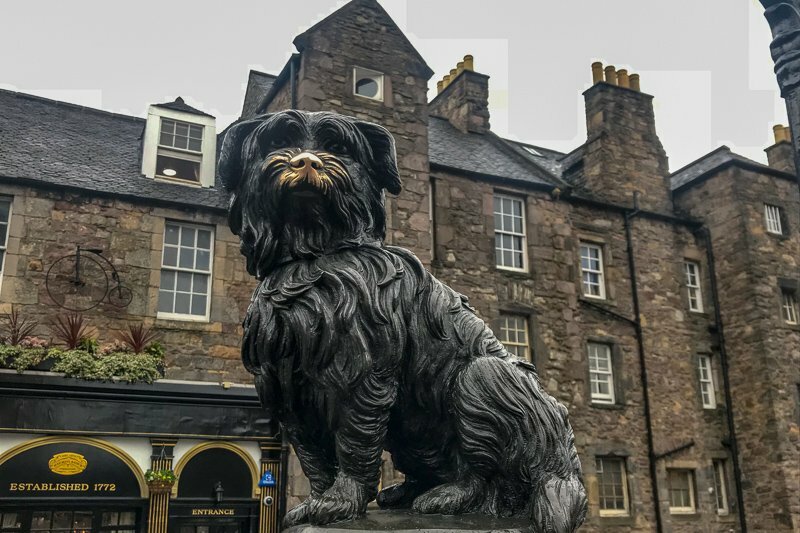 The uplifting story of Greyfriars Bobby became a symbol of loyalty and commitment for the city in hard times. He was buried just near the gates of the Greyfriars cemetery, and later had a statue erected at the end of Candlemakers Row. The tale was even turned into a Hollywood movie which spread the story worldwide. 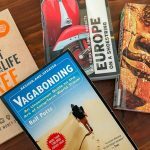 When we were in Porto, Portugal, only a few days before our visit to Edinburgh, we heard a lot about JK Rowling and the Harry Potter books. 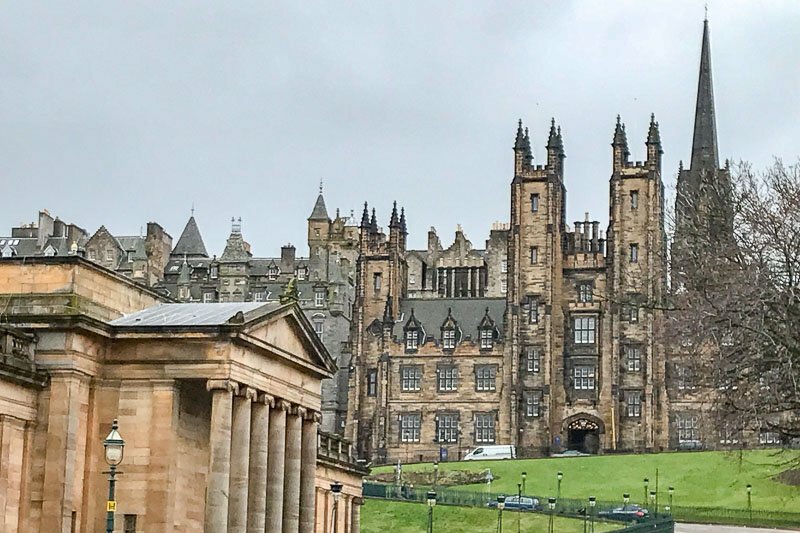 They may have been conceived in Porto, but after writing only three chapters of the first book she moved to Edinburgh, so there are also a lot of popular locations throughout the city that can be linked to Harry Potter. 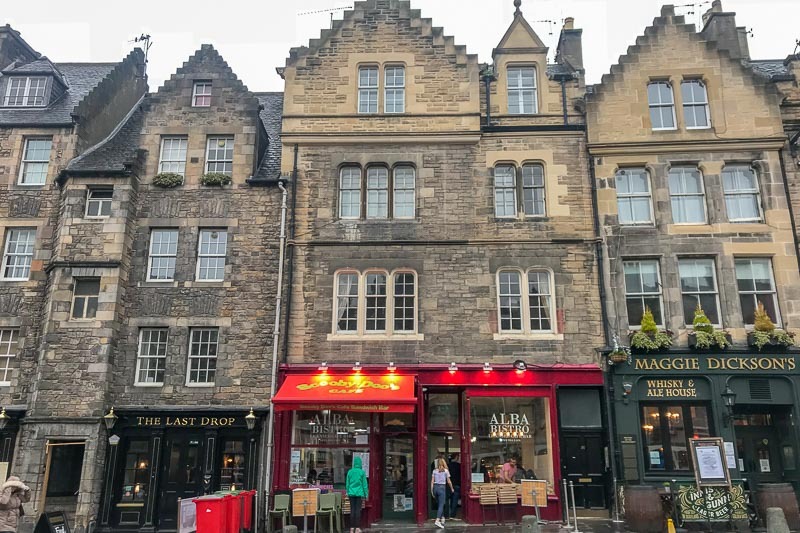 Candlemakers Row, where Greyfriars Bobby sits, is said to have provided inspiration for Diagon Alley. It does meander diagonally through a block and is flanked on either side with cute little shopfronts. Take away the cars and add in a few wizards and gargoyles and I can see the similarities. 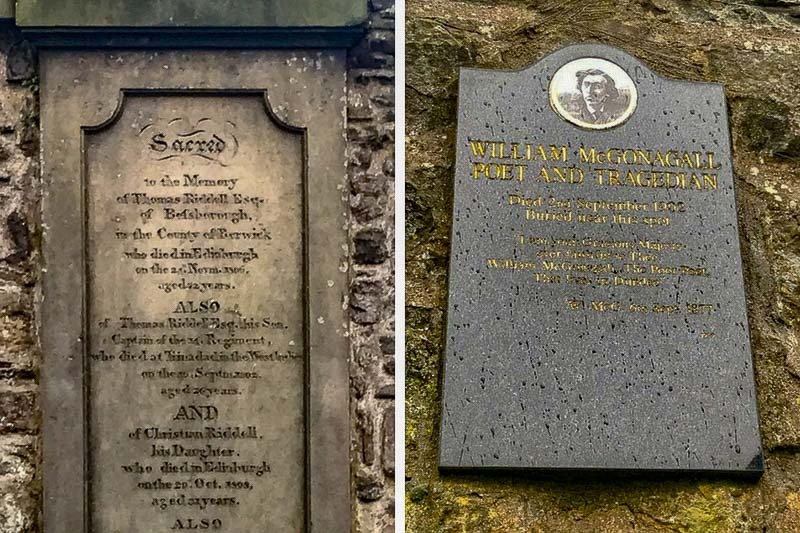 Wandering through the nearby Greyfriars Cemetery will turn up more familiar names. In one corner is the gravestone of Thomas Riddell and his family, and on another wall the name “McGonagall” can be found. 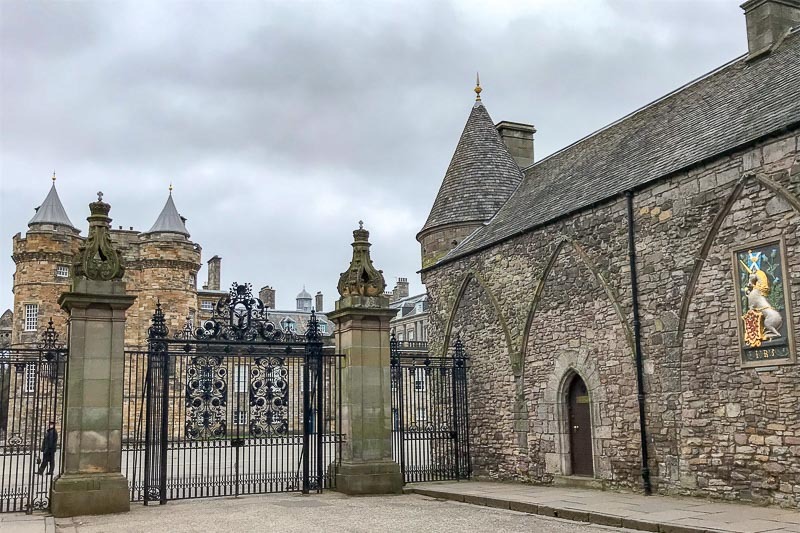 Through some magnificent gates is the exclusive George Heriot’s School, with its turrets which could be a starting point for the Hogwarts design. It’s hard to see but these worn gravestones are for Thomas Riddell and William McGonagall. Familiar names if you are a Harry Potter fan. 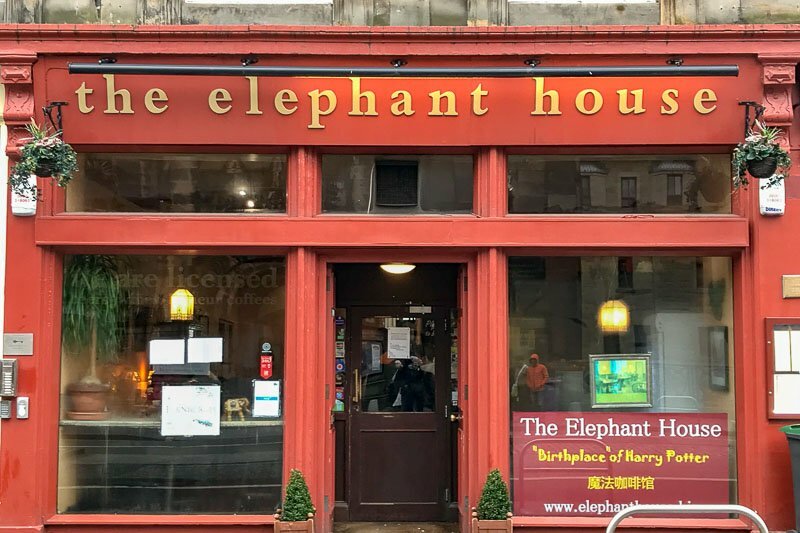 Possibly the most well known of all is The Elephant Cafe, that proudly proclaims to be the birthplace of Harry Potter. I guess that claim is valid since JK Rowling did spend a lot of time there writing, even if he was conceived in Portugal. I had heard mixed reviews about the cafe itself, most said the food was only okay at best. It seems to be typical of places that were probably good in the past, but they become popular for something other than their food. Soon the quality drops off, because they are going to get people visiting them regardless. The Elephant Cafe also charges a couple of pounds if you want to just go in for a photo. We didn’t go in so I can’t comment on whether it is worth it or not. After our Old Town walking tour we made our way to the New Town. It’s not so new really. This is the area that all the well off people started moving to in the 18th Century. Originally a large lake lay right near the Old Town. This was used as a dump, with everything from human waste to animal carcasses to industrial waste ending up in the lake and as such smelled terribly. As a scheme was put in place to drain the lake, more and more of the wealthy wanted to escape from the crowded Old Town and move to the now relatively clean and sweet smelling New Town. The New Town has a modern grid layout with wide streets and grand architecture. The area is now home to many big name stores, shopping centres and trendy bars and restaurants. We had a quick look around before ducking into the Hard Rock Cafe for dinner, to warm up, and to tick another one off Simon’s list. Impressive buildings in every direction in Edinburgh. Looking back towards the Old Town from the New Town. 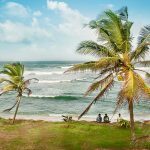 We had enjoyed our free walking tour so much that we chose to book a paid tour with Sandemans the following day. It was the Edinburgh Castle Tour. It was again bitterly cold and we really felt it once we got up on top of the hill to the castle. Our guide this time was Jen, who was just as interesting and fun as Adam was the previous day (but without quite as much of the dramatic tilt). She gave us all of the history of the castle, starting from the extinct volcano that it is perched on up until today. The tour included skip the line tickets, so no waiting for us out the front and we made our way straight inside. We spent two hours with Jen listening to the stories of the castle. 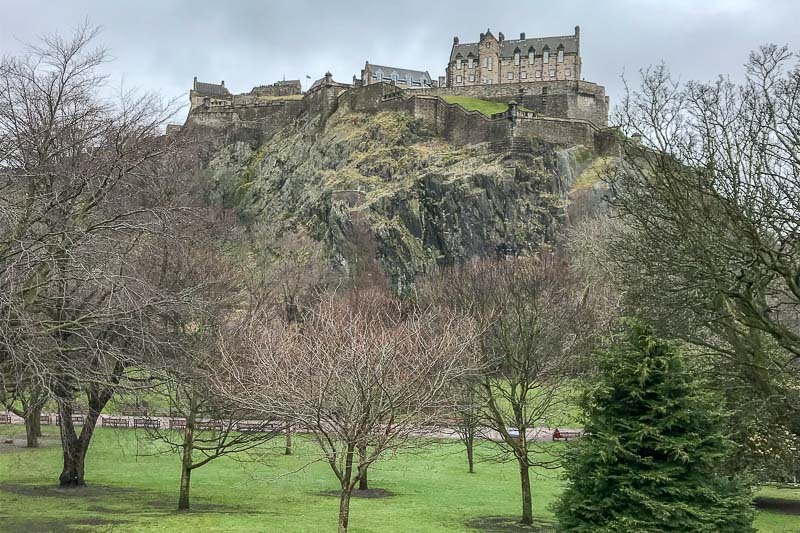 Edinburgh Castle is a true European “castle on the hill”. 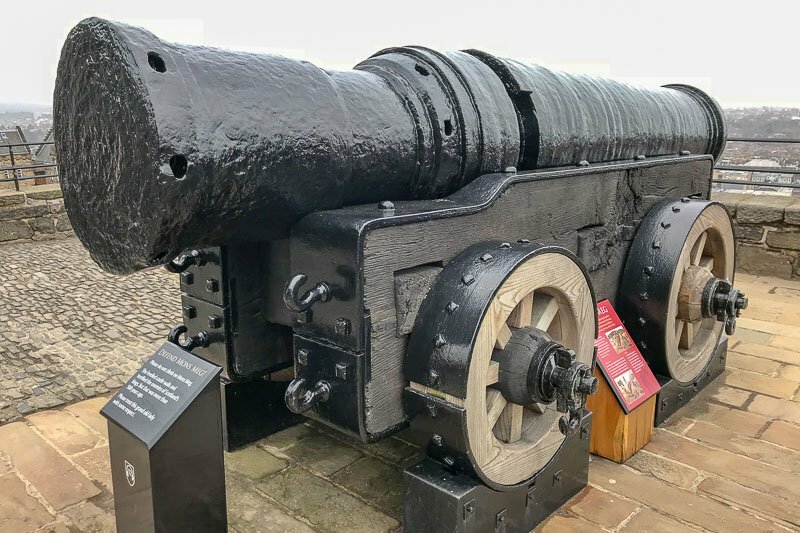 Mons Meg is a huge,15th century cannon that is on display in the grounds of Edinburgh Castle. She was given her name because she was built in Mons. The cannon balls that were shot out of her weighed about 175kg and were over 50cm in diameter. She is fired just once per year, to start the fireworks display on Hogmanay (New Years Eve), but this is now done for show therefore no cannon balls are involved. 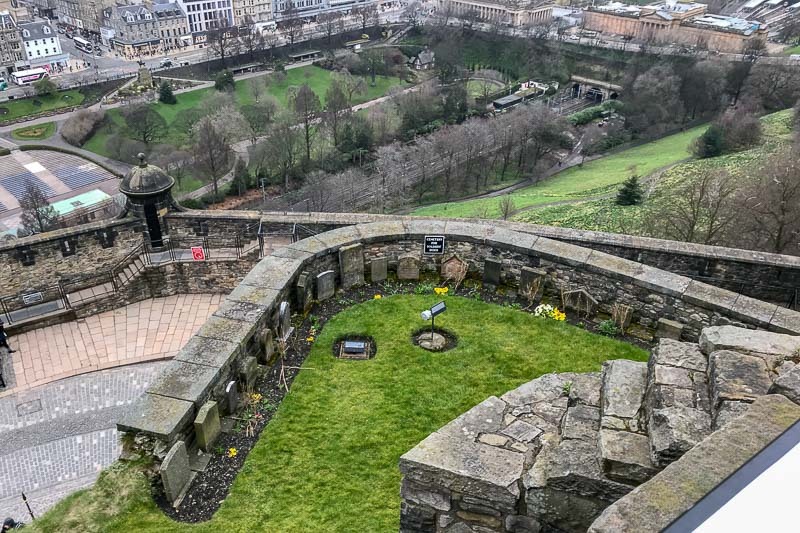 Another curiosity of Edinburgh Castle is the dog cemetery. Here is where the regimental canines, either officers dogs or official mascots, have been buried since the rule of Queen Victoria. Luckily the mascots are no longer buried here, since the current one is a Shetland pony called Cruachan IV. Once the tour ended we had a couple of hours to go into each of the different museums and have a look around. We were also able to see the Scottish Crown Jewels and hear about the Stone of Destiny which is kept with them under the same security. I almost couldn’t believe that what I was seeing was this fabled stone – it just looked like a part of the display the Crown Jewels were leaning on. I did have to confirm with Simon afterwards that was it. The Stone of Destiny story is pretty cool though. Although it is not known exactly where it comes from, this stone is an ancient symbol of Scottish monarchy. When Edward I crowned himself King of Scotland as well as King of England in the 13th century he borrowed the stone and took it down to London. It sat in the base of the Coronation Chair which has been used to crown every monarch since, right up to Queen Elizabeth II in 1953. Not surprisingly though, since this was an important Scottish artefact, the Scots wanted it back. 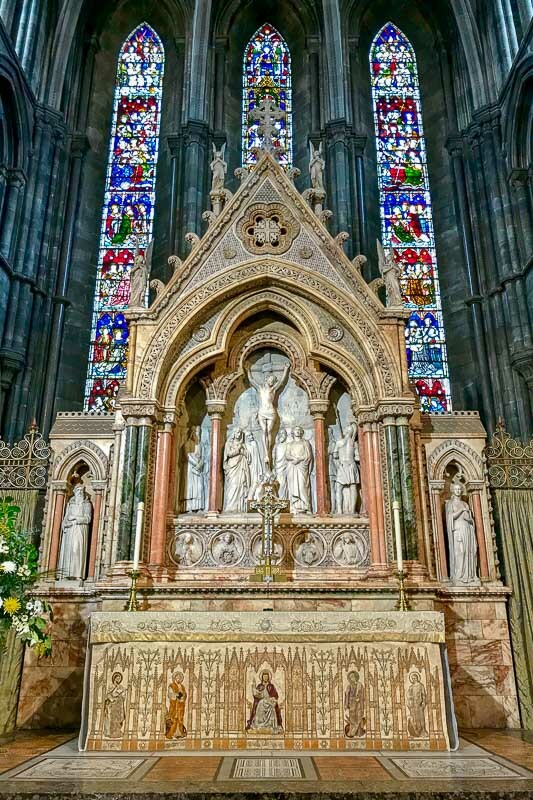 In 1950, four Scottish students managed to steal the stone from Westminster Abbey and bring it back to Scotland. Unfortunately the students decided to tell everyone about their victory, and soon the stone was recovered and sent back to England. 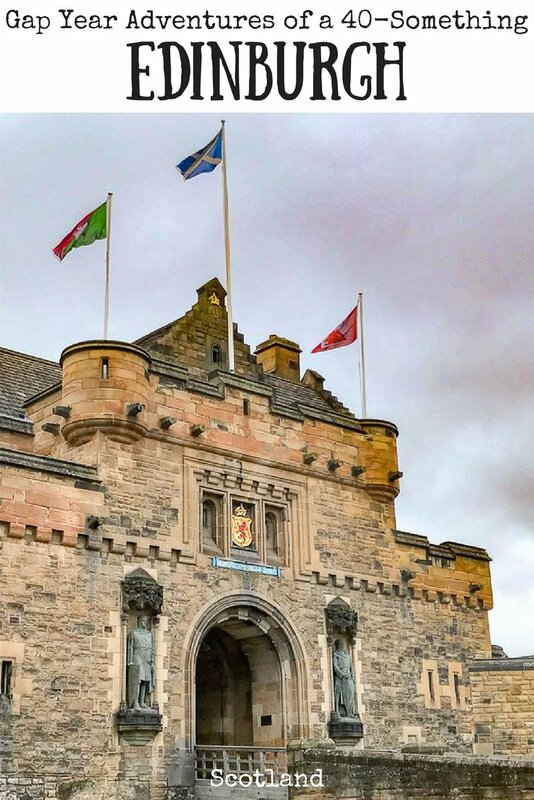 Eventually an agreement was made, and in 1996 the stone officially made it’s way back to Scotland to sit along side the Crown Jewels, showing just how important it is. The big question of course is – will Scotland lend it to the English again when the next monarch is crowned? After all, it did take them 700 years to give it back the last time they borrowed it! Photos weren’t allowed to be taken in the room the Crown Jewels and Stone of Destiny were, but if you would like to see how ordinary it really is, here’s the link to the Wikipedia page. Our final day in Edinburgh was spent mostly just wandering the streets and having a look at some of the things we had heard about but not seen yet. I had hoped to walk up to Arthur’s seat to get some great views over the city, but the weather was just too poor. The below view from Edinburgh castle towards the popular look out point would just have to do. 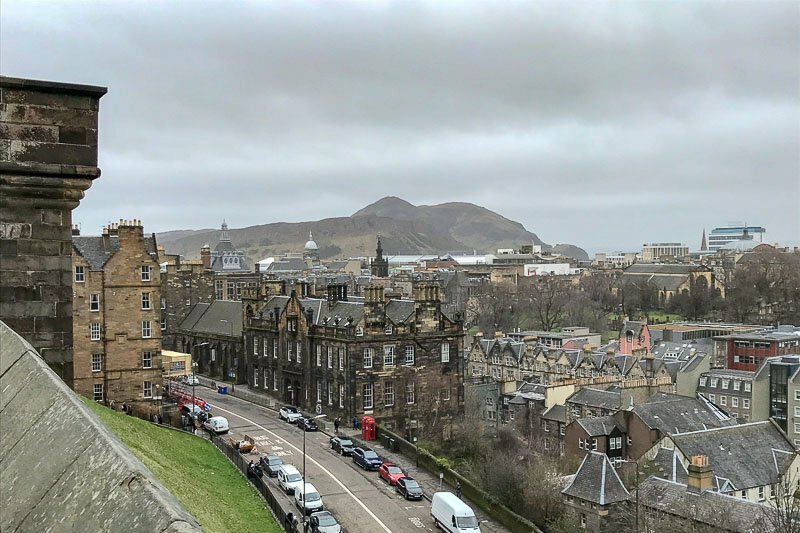 View from Edinburgh Castle towards Arthur’s Seat, a popular hike to get a view over the city. Before we even got into the Old Town, we saw a steeple in the distance and thought we would check it out. We came to the lovely old St Mary’s Cathedral. I was initially drawn to the colour of the daffodils in the garden, because with spring not really having made it to this part of the world yet, it was a rare splash of colour. The inside of the church was quite nice as well, but best of all it was warm, a nice respite from the chill outside. 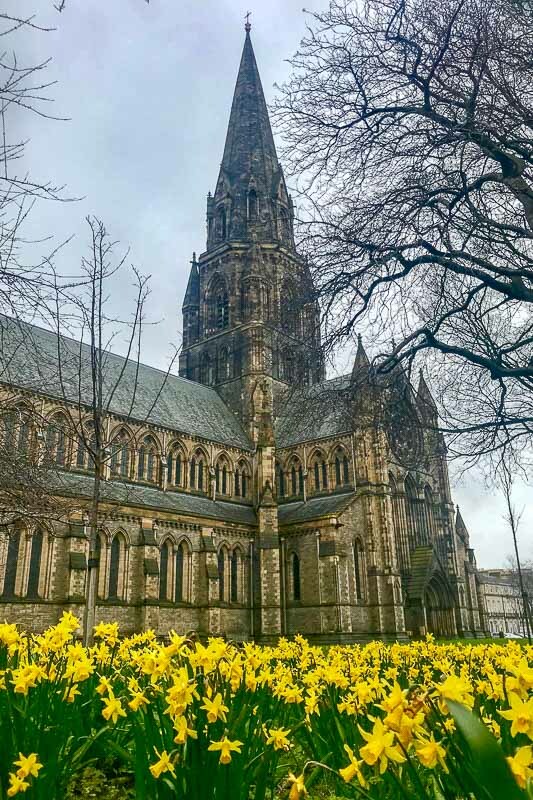 St Mary’s Cathedral. But more impressive, some colour! Some early daffodils in the surrounding gardens. We made our way again down along the Royal Mile, until we reached the end opposite Edinburgh Castle. Here is where the Palace of Holyroodhouse is, the official residence of the British royal family when they are in Edinburgh. It is possible to go inside and visit if the royal family is not in residence, but we decided not to on this occasion. As we made our way back along the Royal Mile we stopped into Fudge House. I had read online that often there are free samples here to taste, and was reminded as soon as I saw it so we had to go in. 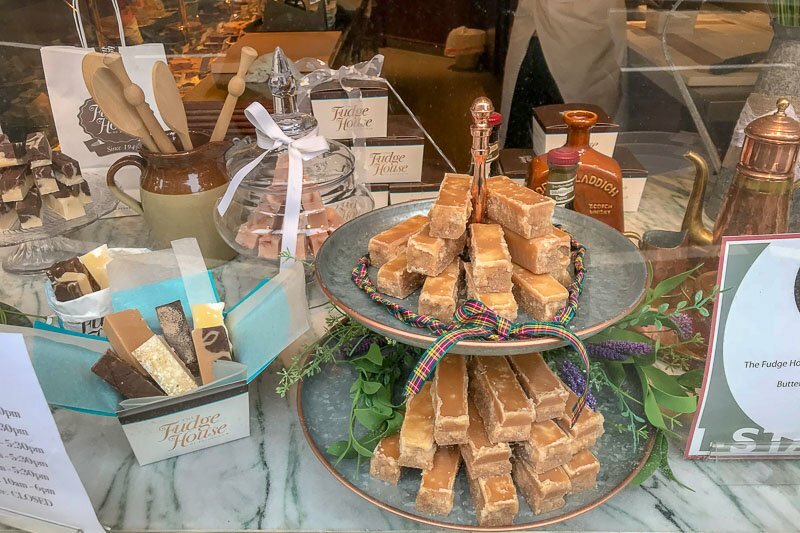 There weren’t any samples available, but we did buy a small piece of fudge each, and I can confirm that it is indeed delicious. Next we ducked into the Museum of Edinburgh. 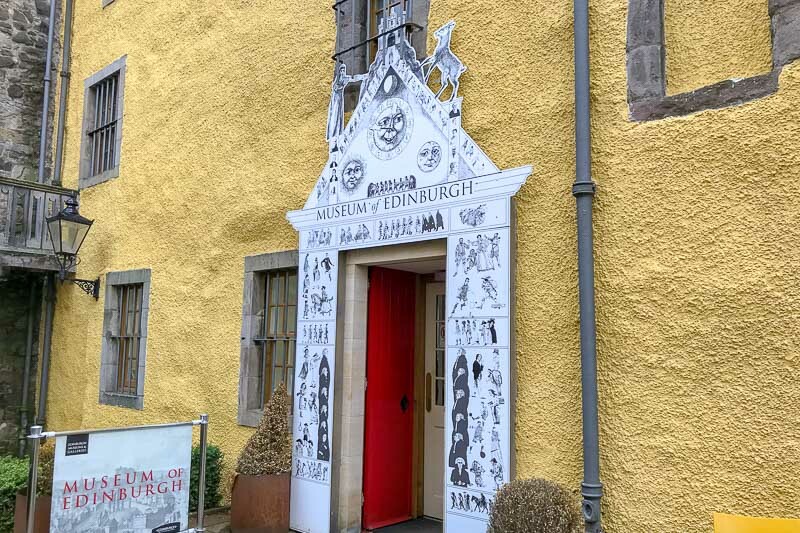 This free museum covers the history of the city, including models of what it looked like in the past and a nice display on Greyfriars Bobby. One of the things that surprised me was that the Royal Mile was quite busy with tourists. I didn’t expect this to be a very busy time of year, especially since the weather was poor, but there were many visitors out and about. It must be a bit of a zoo if visiting in August, the most popular month, when the Edinburgh Tattoo is on and many other festivals also take place. 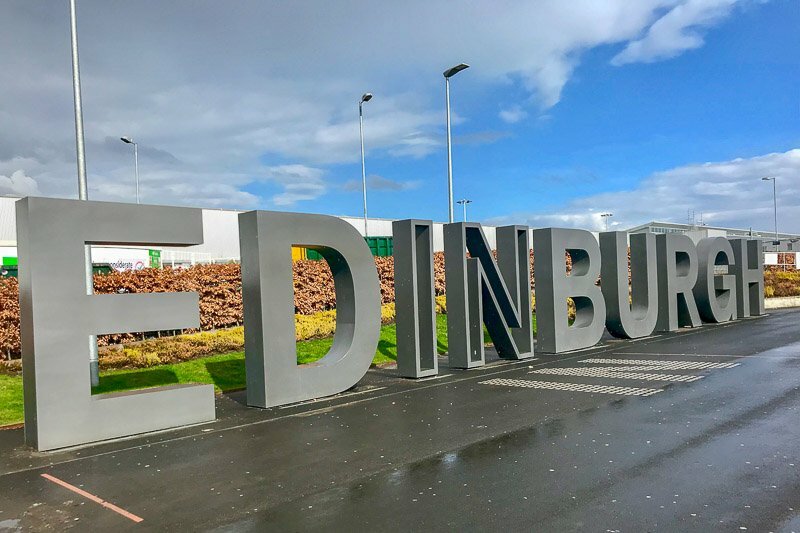 I wonder if Edinburgh is another of those cities, along with Venice, Dubrovnik and Barcelona, that is suffering with the huge number of tourists during the summer. We continued checking out the sites and attractions, visiting one more main place – the National Museum of Scotland. This is another free museum, and there is so much here to see. With our usual bad luck it seemed our timing was off. It was school holidays (which probably also explained the crowds on the Royal Mile), and it was very busy with a lot of families with children. We ended up cutting our visit a little short because it was just too busy for us to enjoy what we were seeing. It would be easy to spend a couple of hours here though, and when we get back to Edinburgh again, I will put it back on my list. 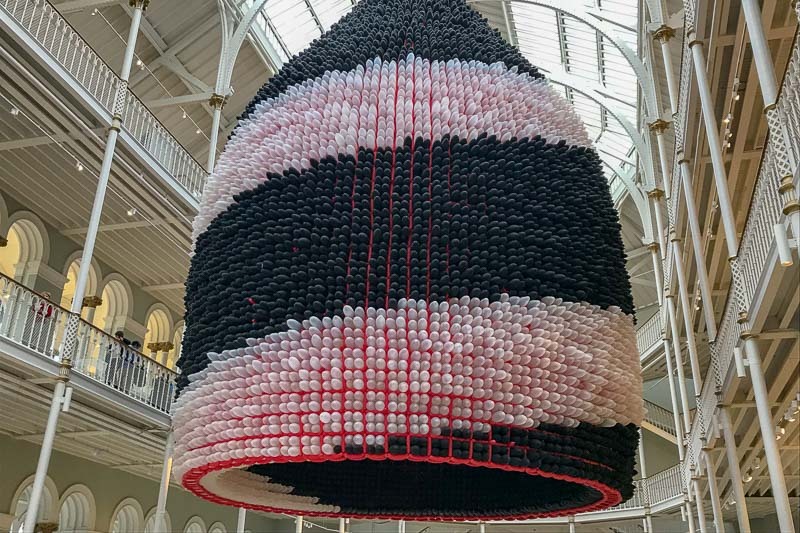 This huge balloon sculpture was hanging in the main atrium of the National Museum of Scotland. It slowly turned, looking mesmerising from directly below. We called it a day after the museum, and began the walk back to our accommodation. The rain was starting to come down again and the warmth beckoned. We had planned to go in the evening to eat at a traditional Scottish pub that was near by, but in the end we sat in front of the TV cheering on the Australian team in the Commonwealth Games. It was a nice coincidence that we were in another Commonwealth country so we could actually do this, as once we moved on the next day, we only saw updates and scores on the internet. Thank you Scotland! If I could change the weather, I would go back to Edinburgh in a heartbeat. I enjoyed the atmosphere, the history, the Scottish humour. I really look forward to getting out to the Scottish highlands and visiting some of the other Scottish cities. I might have to brave the crowds though and come in August to see those three sunny days. Again, because we had a SIM card, seeking out wifi was not such a necessity for us. When we did use it the speed was okay. Our accommodation only provided wifi in the common areas, so I am not sure if this is the norm in Scotland or this was just a one off incident. We really only used the tram too and from the airport and that was an easy, stress free option. We discovered there were also buses that go to the airport for slightly less, but they take longer and the ones I saw seemed really crowded. 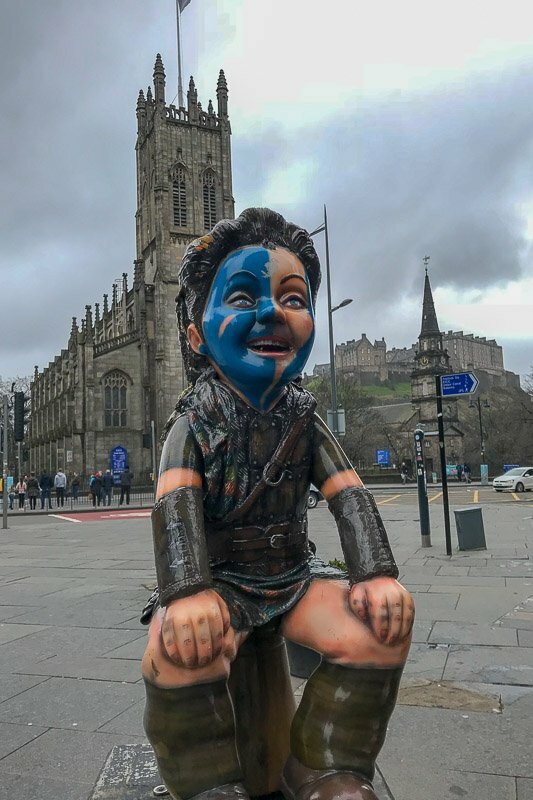 I love Edinburgh. I’ve been there six times, I think, spending a week or so there once. Yes, it can be cold and foggy and rainy and all the rest of it, but what a fabulous old city it is! Did you look into the toilets in the Elephant House. The walls are covered with graffiti-ed love letters to J K Rowling and the various characters. Some of them more than a little off-colour. 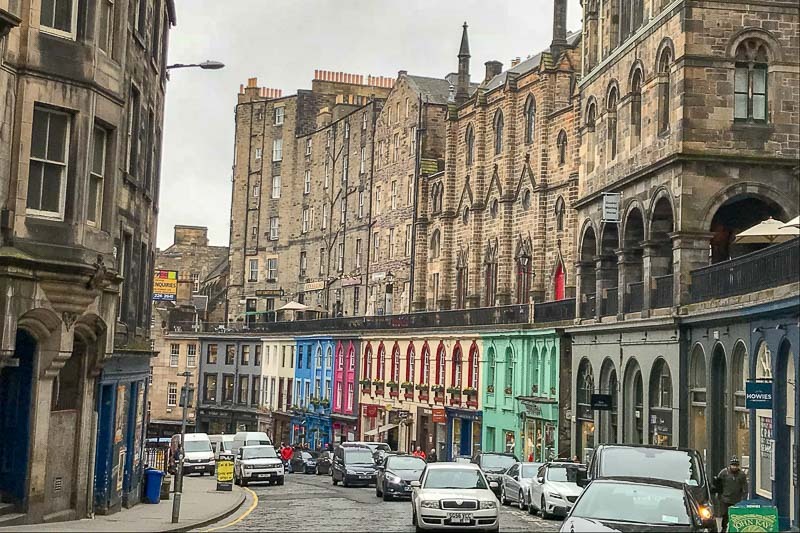 I just love looking at photos of the streets and buildings in Edinburgh – even in the daytime, they look so moody and evocative! Yes! “Moody” is exactly the right word. It’s like the buildings just ooze history here. I love that your posts are written in a diary style. It adds that little touch of intimacy that is so relatable :). Oh, thank you! The people I know always say they can hear my voice because these are written just how I would speak. I am so glad other people find it relatable too! Edinburgh looks so pretty! I love the architecture! 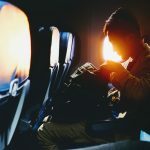 Great post and great photos! Thanks Andrea. I found the stories and history to be even better than how the city looks. So worth a visit. It looks like you saw so much! I was in Edinburgh last Summer, only for a day, but I wish I had taken the free walking tour. It sounds so amazing! Thanks Samantha! I still feel like there is so much more to see in Edinburgh. I could have spent another week there.